You access these configurations by selecting on the ‘Registration’ tab after clicking the ‘Advanced Options’ button when creating your meeting. 1. You can make registration mandatory, optional or not require it all (registration is turned off by default). 2. We have a list of pre-defined commonly used fields – you can make use of these by selecting the appropriate the check boxes to the right of each field. ‘Show’ render the field on the registration form, you can make a field mandatory by checking the ‘Required’ check box. 3. 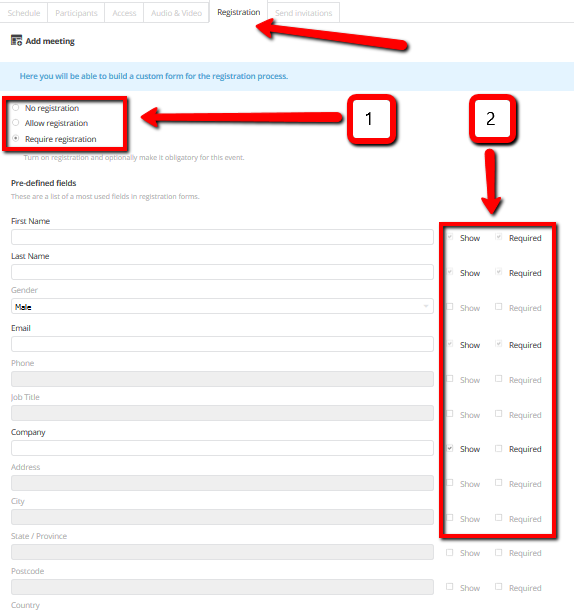 You can also add your own custom form fields and again decide if you want to make any of these fields mandatory during the registration process. 4. You can customize your registration URL rather than use the randomly generated characters that OnSync uses to identify your event registration page. 5. You can optionally require a password before someone can complete registration. 6. You may want to cap the amount of people who can register for your event. 7. Once someone has completed the registration process – you can modify the message that is shown or redirect them to a webpage of your choice. 8. 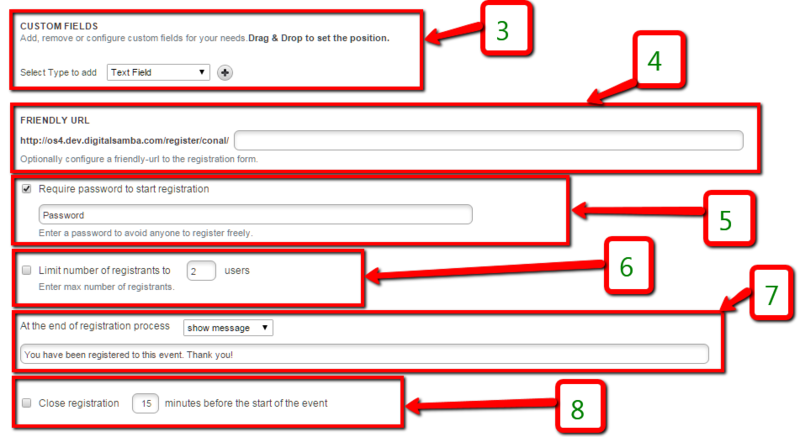 You can optionally set a time limit after which people will no longer be allowed to register for your event.